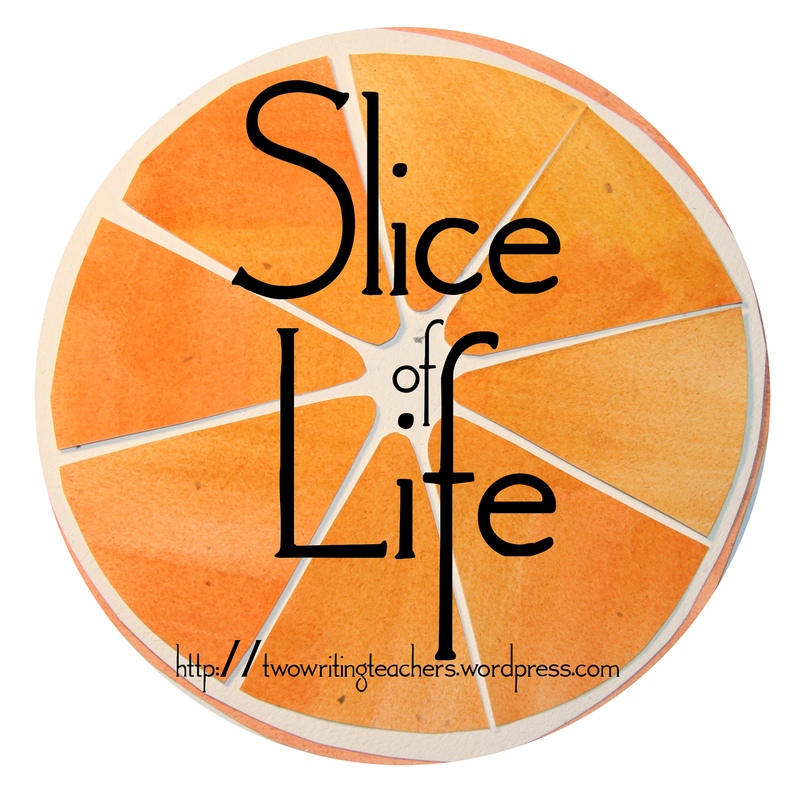 The annual March Slice of Life Challenge is hosted at Two Writing Teachers. For the past year I’ve been spending most Saturday mornings at a little coffee shop on Damen Ave. with my writing partner Kristin. Over the months our newest book has been taking shape fueled by massive amounts of coffee (what else? ), the smell of bacon smoke in the air, occasional 80’s power ballads, and the general feeling that we’re trying to make a difference in the world. Most of these mornings were spent on a big green leather couch stationed at the back of the room. An ideal place for writing, people watching, and generally overseeing the goings on of the coffee shop. One recent morning I walked in to find that the couch had been moved. My second thought was “what is in its place?! ?” There in the back of the room hogging the space that our beloved couch had once lived in was a retro reddish orange kitchen table. I glared at it in disgust and distrust. Our beloved green home had been moved to the front of the coffee shop, right in the middle of the chaos and was now joined by another couch. It was an overall unwelcome change. Now chaos abounded around us, other people invaded our space, and our writing mojo was thrown by the constant din of the door banging shut. The next week I felt anxious walking in the door. I trudged slowly to the back of the coffee shop and set my bag down tentatively on the table. I unpacked slowly, hesitantly as if the table might blow up at any minute. As I set up my computer I ran my fingers over the tacky laminate surface noting the old coffee stains, the scratches along the edge. 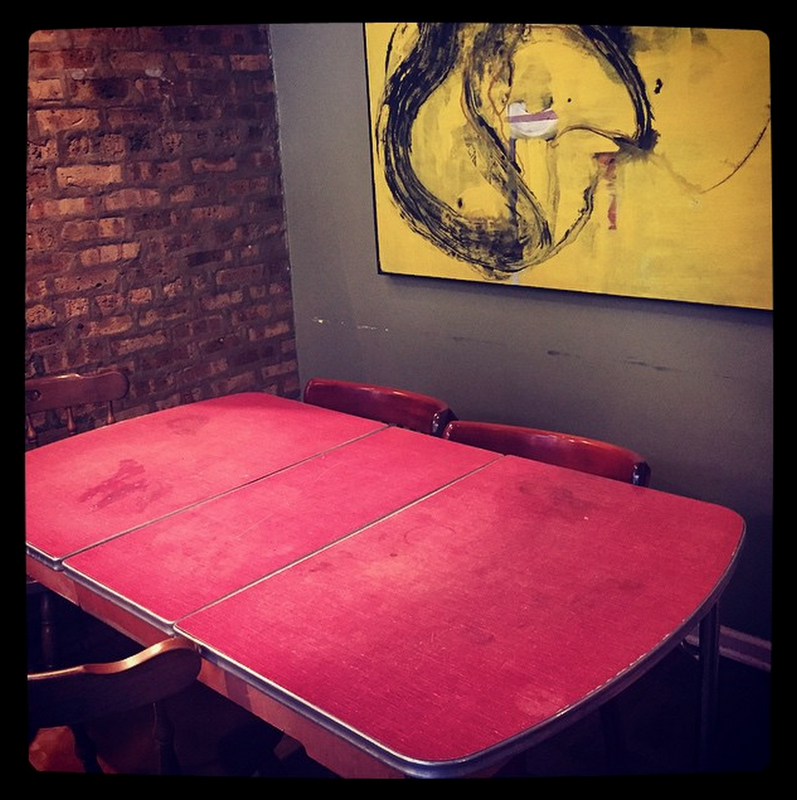 This table had history. This table had a story to tell. It was then that I thought perhaps it was fate, that this table was put here for a purpose. A storytelling table for two storytellers. 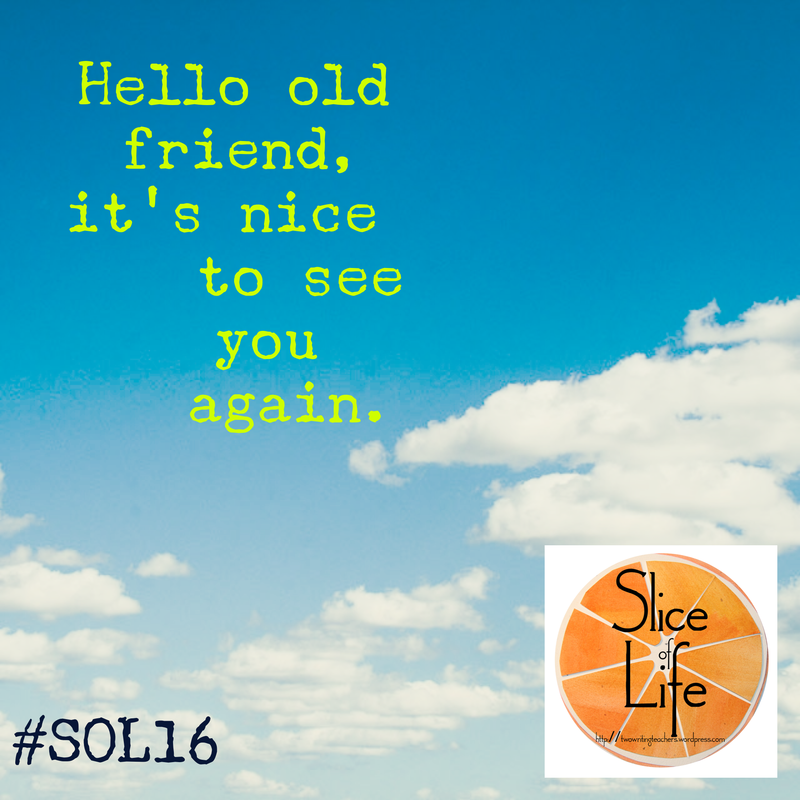 Join the Slice of Life community at Two Writing Teachers. February is normally a stress-filled month. Every year since I began teaching we’ve had testing the first week in March. This year there is no ISAT test the first week of March and it’s made for a wonderful and strange month. Over the years I developed strategies for preparing my students for the ISAT tests (not prepping them) that minimized the impact on our day to day. But since school started back up in January I haven’t given testing more that a fleeting moment of a flicker of a thought. In fact the only thought I’ve given to it is wondering if we will even be taking the PARCC test this year. No one seems to know. 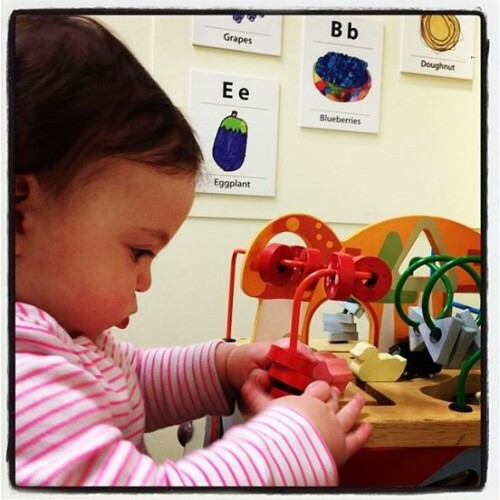 Chicago is in a battle to not take the tests citing that the schools aren’t technology ready. The federal and state government aren’t happy. Will we? Won’t we? Who knows? At any rate we’ve done nothing to test prep. I’m confident my students are as prepared for the challenge as they should be because I’ve been teaching hard all year long and honestly, that should be enough. For now, I will enjoy it; focus on getting myself back to weekly slicing and getting my students prepared to take the month long slice of life challenge. That seems like a much more worthy use of my time. I stepped gingerly onto the ice covered parking lot clutching Gigi in my arms. As I mentally calculated the distance from my stairs to my car I began to shuffle my feet slowly. My gosh, I thought, we’ll never make it! shuffle, shuffle. shuffle, shuffle. Ten minutes later I was buckling Gigi in and soon inching my way down the equally slick side streets. I decided to park illegally at the bank across from the daycare. The streets were still congested with snow and now ice and I didn’t want to risk getting stuck. Unfortunately in my haste I momentarily forgot about the ice. It only took me about three steps up the slight incline before I found myself in the air and then on the ground. “Ow,” I screamed as my tailbone smacked the pavement hard and my right arm, which had shot out to break my fall, plunged into a chunky icy snow bank. My bare skin burned with the contact of the cold. Somehow my mother instincts made sure Gigi landed on top of me and she just giggled, thinking the whole thing part of some silly game. I slowly got to my feet and dropped her off, thankful that she was okay, but sad about the now growing pain in my back. I will be very happy when winter is over. Tuesday. It’s Mommy Baby day! 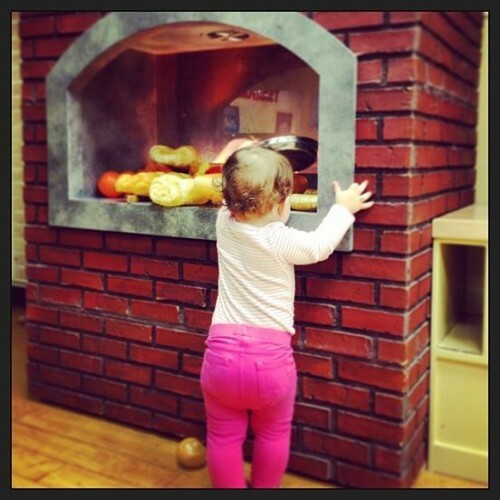 As a special treat I decided to take Gigi to the Chicago Children’s Museum today. Although Gigi was skeptical when we got in the car (By skeptical I mean she screamed at the top of her lungs and made her body as stiff as a board) she started to perk up when we arrived at Navy Pier. It might have been the smell of cinnamon roasted nuts or the sight of Build-A-Bear. (Thank goodness she doesn’t know what that is yet.) As soon as I released her from her stroller she was up and moving. Literally. See she really just learned how to walk in the last week or so. “Up, up,” she commanded. This is her word now. “Up!” Up means give me your hand so that I can drag you all around where ever I want to go. “Up” also means pick me up so I can play flop my body on the couch while you desperately try to keep me from flying off the couch. Occasionally “Up” means pick me up and cuddle me I’m tired. So Up we went. 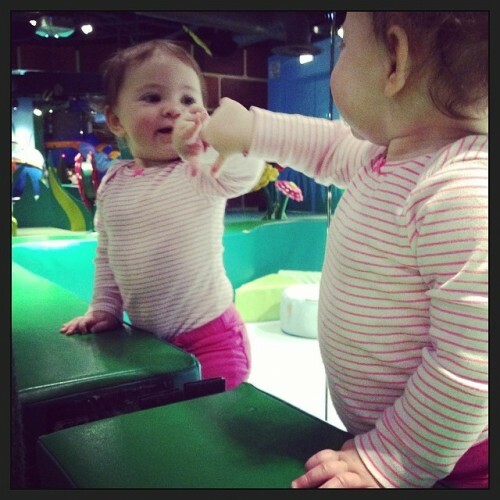 Up to the bubbles exhibit where she toddled and pointed wildly. 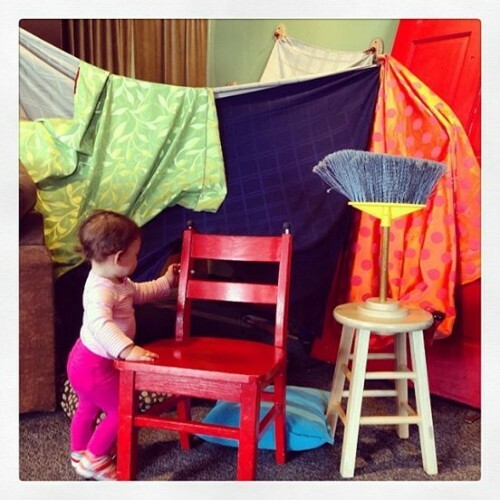 Up to the fort exhibit where she climbed on an upside down table. Up to the babies room where she tried to eat a chunk of wood meant for the light table. Up to kid town where she pushed a little shopping cart around into people legs. Up to the Big Backyard where she giggled along with fake flowers. Up, Up, Up. I originally had the title of this post as Big Flowers and Bubbles but as I got to the end of my writing I realized that I had kind of gone off on this tangent about her new word “Up.” Although she knows other words this is the one you hear ALL DAY LONG. So I decided that would be the best title for this piece.